Asheville Framing has set the floor trusses on the TimberPeg home in Arden, North Carolina. 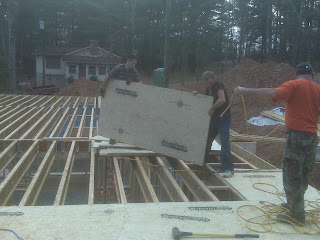 Here they are laying the sheathing for the floor. The Timbers were delivered yesterday, November 19, 2008. Our men will be setting the timbers with the help of the TimberPeg consultant.